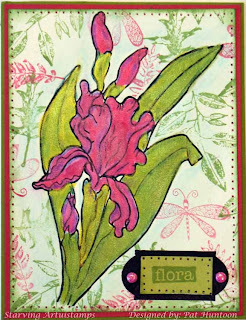 This week's sketch from Mary Jo Price Williams Technostamper's Sketch Challenge is an easy classic. I had so many ideas for this sketch that I didn't know how to begin! I finally settled on a Triptych featuring the Walnut Ink Resist from the April 2008 issue of the Technique Junkie Newsletter. I used a Coppery Walnut Ink and it is very shimmery in person. I love the way this turned out. 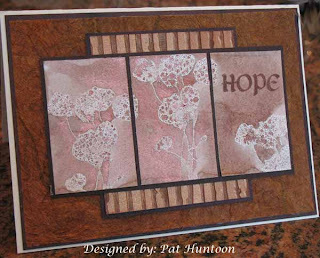 This 5" x 7" Sympathy card uses Bella Rosa Paper Art Stamps for the Flowers, combined with a Lasting Impressions with Panache word- "Hope". The piece behind the flowers is a copper paper that I ran through my Cuttlebug. 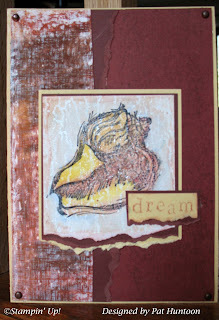 The Background paper is a gorgeous piece of handmade mulberry paper that I had in my stash. Make sure to go to Mary Jo's Blog to see the original sketch, and to play along! Today's Blogger's Challenge is all about Springtime Flowers. I have a whole bouquet for you! My friend Ida sent me this cat image -- she knows how much I adore cats, after all (if you want to know more about my cat "affection", go to my "Cruel Cats" page-- it may just make you laugh!). I do have to admit, that this cat is cute. Mainly because it is just an image (LOL). My cat & the flowers were colored using Watercolor pencils and a blender pen. The cool background uses the Artsy Dimension technique from the newest (April 2008) edition of the Technique Junkie Newsletter. I thought the colorful background with the flowered Cuttlebugged dimension added just the right touch to the cat. The inside of the card says "...a wonderful spring". Sorry that I can't tell you who makes the cat -- it was not my stamp. Anyone know? 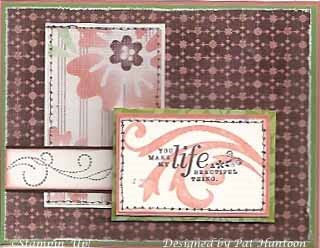 In any case, go check out the work of the other stampers on the Blogger's challenge list on my sidebar. There are tons of great artists in the challenge! Hey y'all! Anyone else have Spring fever? I do! It is not very springy here, but it is much better than just two weeks ago, when it felt so wintry -- at least now it feels like there is light at the end of the tunnel. 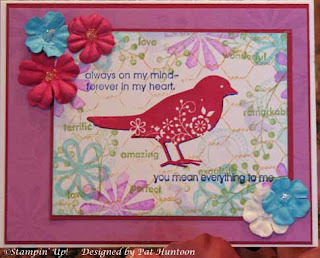 To celebrate spring, today's card uses some very springlike images -- birds and flowers. I hope my little card brings some spring to you! This card uses the Color Collage Technique from the April 2008 issue of the Technique Junkie Newsletter. I am in a "Beaktacular" one-on-one swap, and I needed to create a card using Stampin' Up! stamps that featured a bird. This is the card for my partner. Today I have a real treat for you. 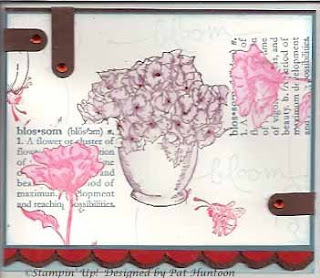 The giveaway today is an 8-1/2" x 11" unmounted stamp sheet from Innovative Stamp Creations. This sheet has 22 stamps on it -- WOW! The sheet name is "Assemblage" - and that inspired me to create my own assemblage from another set from ISC called "Mona Lisa Art". The treat with this card is that it is the background is a sneak preview for a technique from the APRIL 2008 edition of the Technique Junkie Newsletter! 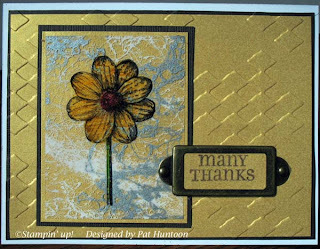 The background of this card uses a technique outlined in the newsletter called Mesh Direct. It is a fun (and easy) technique that works great with serious cards, fun cards -- actually, just about any style! 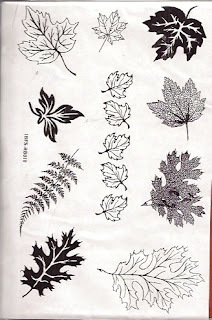 If you are a Technique Junkie, make sure to check out the artwork using this technique on the artwork only pages -- there are tons of examples there. The Subscriber-Only pages will be available to you on Thursday. Not a subscriber? Well, no worries -- I have a deal for you posted at the top of this blog. You can be an online subscriber for the 2008 issues for under $10.00! Our newest Fansy Designs stamp sheet will debut this week! Certain stamp sheets only are on SALE this week only! Grungeboard Alphabets are 15% off and Fragments too -this week only! Buy 6 Adirondack Dabbers and recv an additional bottle of your choice for FREE total of 7! We have Teresa Collins new cardstock/bracket book covers in stock! New Inkssential White Gel Pen coming this week! ANYONE can enter this give away. One entry per person, per give away, please. To enter the give away for today, simply leave a comment on this blog entry telling me that you would like to enter by 11:59pm EST on Friday, March 28th. No other entry methods will be included in the give away. If you email me to enter, your entry will NOT be considered a valid entry. When you leave the comment, make sure to put your NAME in the comment -- if you enter your comment as "Anonymous", I cannot give you the prize! Blogger does NOT record your email address for me, so you will need to check back to find out if you have won or include your email address in your comment so that I can notify you. A good way to do this is like so: phuntoon at optonline dot net -- it will help protect your privacy! I will have a random number generator pick one number from the comments to select one winner. Each give-away is separate, so to be eligible for a specific item you must enter that day's contest on the post where it is listed. Enter today -- good luck! I have blog give aways every week -- come play! Congratulations to Germana Ferrao Lenn, winner of the giveaway! I really like the layout for this week's sketch for the Technostamper Sketch Challenge #10. Although the sketch (below) uses an arrow, I took a little liberty with that in my sketch. The only technique I used this week was Faux Stitching for the chocolate brown stiches on the two top panels. 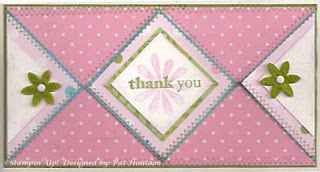 All of the stamps, paper and inks this week are from Stampin' Up!. The original sketch is below. 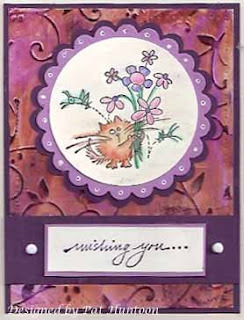 Visit Mary Jo Price-William's blog to see the cards from the other players this week. I have to admit, I love this color combination. Blue Bayou, Soft Sky, Real Red and Chocolate Chip -- lovely colors together, really. This challenge was a breeze for me this week! I wanted to try to make a soft card with these bold an beautiful colors. I chose to make a card that is a "constrained collage" -- don't go looking for the techique, I just made that phrase up! wanted the collage look with a very neat layout. I just dusted off my masking skills, and used the Ink Wash Technique from the April/May 2007 Technique Junkie Newsletter to color the flowers. I happened to have the gems on my desktop (an advantage of not putting things away, LOL), and I added some red stickles to the flower centers to add more bling. A little pierced & layered scallop on the bottom, and Voila! My card is completed. Um...my sketch challenge for the Technostamper Sketch Challenge #9 is a tad bit late. Normally I post my rendition on Mondays -- but this week, it just didn't happen! One of those week, KWIM? This one was hard for me, at least until I actually started making the card -- then it was simple! This card has NO techniques on it (can you believe that?). I was actually concentrating on getting the stitch stamp straight. Have you ever seen Beate Johns' work? Her stitch stamping is always straight -- I don't know how she does it! Did you ever get a new stamp and know in your heart-of-hearts that it would be fabulous used in a certain way? 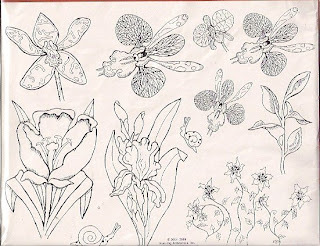 Well, that is how I was with the flower stamps on the sheet of rubber from Starving Artistamps in today's giveaway. I just knew it any of the flowers on the sheet would be outstanding used with the Penciled Twinks Technique from the February 2008 issue of the Technique Junkie Newsletter. I loved it so much that I made two cards -- one to give away and one to keep! Today's lucky winner will receive this huge 8-1/2" x 11" sheet of deeply etched rubber from Starving Artistamps, plus the card shown above. These gorgeous flower images are perfect for spring, aren't they? 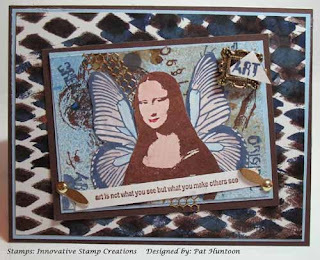 All of the images from Starving Artistamps are great -- and Tracey has a special offer for you this week, too! For each 8 1/2 x 11 full sheet of rubber you purchase, get a FREE Sheet of original cling cushion (retail value: $4.25). Offer valid on all new orders placed between now and 3/25/08. To take advantage simply place your order during this time -- your cling cushion will be automatically added to your package. If you need to order more cling cushion you can add that to your cart as usual. This offer is not valid on smaller sets or individual images. ANYONE can enter this give away. One entry per person, per give away, please. To enter the give away for today, simply leave a comment on this blog entry telling me that you would like to enter by 11:59pm EST on Sunday, March 23rd. No other entry methods will be included in the give away. If you email me to enter, your entry will NOT be considered a valid entry. When you leave the comment, make sure to put your NAME in the comment -- if you enter your comment as "Anonymous", I cannot give you the prize! Blogger does NOT record your email address for me, so you will need to check back to find out if you have won or include your email address in your comment so that I can notify you. A good way to do this is like so: phuntoon at optonline dot net -- it will help protect your privacy! I will have a random number generator pick one number from the comments to select one winner. Each give-away is separate, so to be eligible for a specific item you must enter that day's contest on the post where it is listed. Enter today -- good luck! I have blog give aways every week -- come play! The winner of this giveaway is Chick Alizadeh! Congrats, Chick! 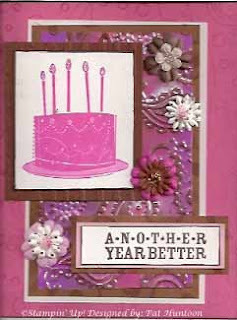 This week's Blogger's Challenge was to make a Birthday card. Before I get to the details of the card, guess what? Lisa and Gerrie are both celebrating birthdays this week. Happy Birthday, Girls!!! I consider both of these talented ladies good friends and if you appreciate the inspiration they provide to the stamping community as much as I do, drop by their blogs and wish them a happy day (both are offering blog candy this week, too!). My card uses a new Paisley Cuttlebug folder (did I mention that I am flying high with 9 - yup nine - new Cuttlebug folders?) on the Aged Metal technique from the February issue of the Technique Junkie Newsletter. If you missed the news, Betsy Griffin has some of the Shimmer Sheetz in stock on the Innovative Stamp Creations website! If you are a TJer, you know these have been in short supply, so RUN (or click really, really fast) over to her website and order up some! The stamps on this card are Stampin' Up! 's Birthday Whimsy, and one of the greetings from the big Block Party set. If you are familiar with this set, you know it was originally 3 stamps, with 11 or so individual greetings. I thought that was a waste of good greetings : ) so I simply ordered the matching block set from The Block Guy and mounted them separately. Today's giveaway is for 24 saying stamps from Stampin' Up!. That's right, 24! Today I am giving away the "Lots of Thoughts" set, which normally is a set of 6...but this is a set of 24. The set has been cut apart and remounted for you on 12 blocks (2 sayings to a block) by using the blocks from The Block Guy, our sponsor of today's giveaway. I just love the idea that using a few more blocks expands the use of so many sets! Mitch Kemp, who IS The Block Guy, sells many other block sets to coordinate with many SU sets. Go take a look! In addition to the stamps, the winner will receive the card above, which uses the Webbed Acetate Technique from the December 2005 issue of the Technique Junkie Newsletter. (I just got 9 new Cuttlebug folders, too, hence the background; I am in heaven!). 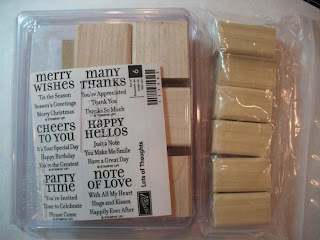 I simply punched out the stamps (they come pre-punched which is pretty darn handy! ), and cut the stamps apart. I use Kai scissors to do this; some people prefer a craft knife. 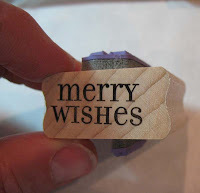 If some of the words are close together, simply bend the rubber a bit to separate them when cutting. When cut, I mounted one saying to each side of a block. I added the index print to the sides...and viola! A set of 24. ANYONE can enter this give away. One entry per person, per give away, please. To enter the give away for today, simply leave a comment on this blog entry telling me that you would like to enter by 11:59pm EST on Friday, March 14th. No other entry methods will be included in the give away. If you email me to enter, your entry will NOT be considered a valid entry. When you leave the comment, make sure to put your NAME in the comment -- if you enter your comment as "Anonymous", I cannot give you the prize! Blogger does NOT record your email address for me, so you will need to check back to find out if you have won or include your email address in your comment so that I can notify you. A good way to do this is like so: phuntoon at optonline dot net -- it will help protect your privacy! I will have a random number generator pick one number from the comments to select one winner. Each give-away is separate, so to be eligible for a specific item you must enter that day's contest on the post where it is listed. Enter today -- good luck! I have blog give aways every week -- come play! The winner of the stamp set and card is Melissa Erickson! Congratulations, Melissa! This week's Technostamper Sketch Challenge is pretty easy -- and my 5" x 7" card was a summer breeze to make. My card uses the Oil Pastel Gesso Technique for the left strip, and the Magic Pattern Technique for the main image. Both techniques can be found in the February 2008 issue of the Technique Junkie Newsletter. 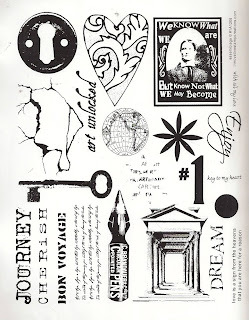 If you would like to play along, go to Mary Jo Price William's Blog for the original sketch -- have fun! 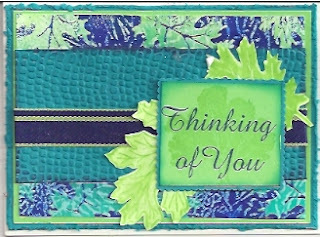 Today's Wonderful Wednesday Giveaway is courtesy of Della Warr from I Brake for Stamps. This sheet of deeply etched stamp is full of leaf images in a variety of styles that are perfect for Spring, Summer and Fall cards! Along with the stamp sheet shown above, the winner of today's giveaway will receive the card at right, which features the stamps with a Joseph's Coat with a Twist background, from the February 2008 issue of the Technique Junkie Newsletter. When you visit the I Brake for Stamps site, note that this set is now on sale for 30% off -- as are several other great sets! Visit the Specials page for some wonderful deals. Okay, want to know how you can be the lucky give away winner? ANYONE can enter this give away. One entry per person, per give away, please. To enter the give away for today, simply leave a comment on this blog entry telling me that you would like to enter by 11:59pm EST on Friday March 7th. No other entry methods will be included in the give away. If you email me to enter, your entry will NOT be considered a valid entry. When you leave the comment, make sure to put your NAME in the comment -- if you enter your comment as "Anonymous", I cannot give you the prize! Blogger does NOT record your email address for me, so you will need to check back to find out if you have won or include your email address in your comment so that I can notify you. A good way to do this is like so: phuntoon at optonline dot net -- it will help protect your privacy! I will have a random number generator pick one number from the comments to select one winner. Each give-away is separate, so to be eligible for a specific item you must enter that day's contest on the post where it is listed. Enter today -- good luck! I have blog give aways every week -- come play! Congratulations to Susan Moore -- the winner of this Giveaway!